It is easy to plant and easy to grow, and it’s versatile as well. You can add it raw in salads, or with dips or you can bake, braise, steam, or mash it. It tastes much like broccoli, and is related to the cabbage plant. Growing kohlrabi is fun, too. It’s an early veggie, so we plant it in early March, directly into the ground. It takes about 50-70 days, depending on weather, and we have our harvest in May. We also plant it again in late July for a fall harvest. To store it, you can place it in the fridge, or freeze it by blanching a whole bulb for 3 minutes, then an ice water bath. The greens are delicious, and the whole veggie has a spicy, peppery bite that goes with just about anything. 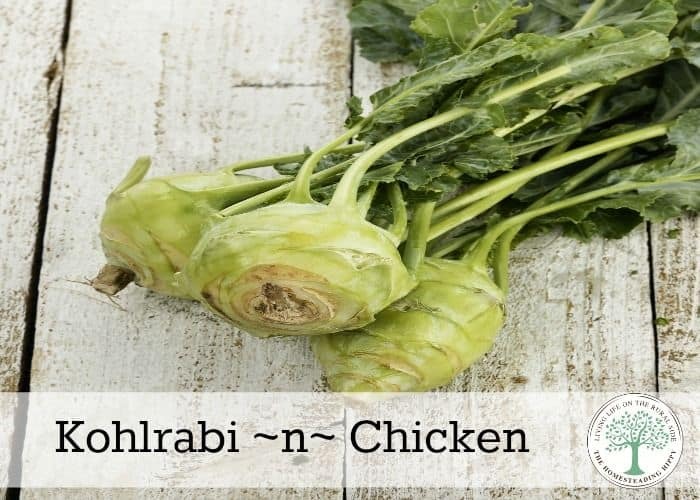 This Kohlrabi And Chicken Dinner is so easy to make, too! Start by bringing 4 cups of broth with the rice to a boil. Turn to medium low heat to cook. Next, peel the kohlrabi. The outer edge is rather woody, and that makes it rather unedible. Slice in thin coins. Heat a skillet with 2 tablespoons tallow or coconut oil and add garlic and onion. Season with salt and pepper and sweat for about 3 minutes. Add the kohlrabi and stir well to combine. Lay the chicken breast strips across the veggie mixture, and pour the remaing broth around in the pan and bring to a boil. Reduce heat to simmer, and simmer for about 15 minutes or until kohlrabi is soft and chicken is steam cooked through. Top with parsley and serve over cooked rice. 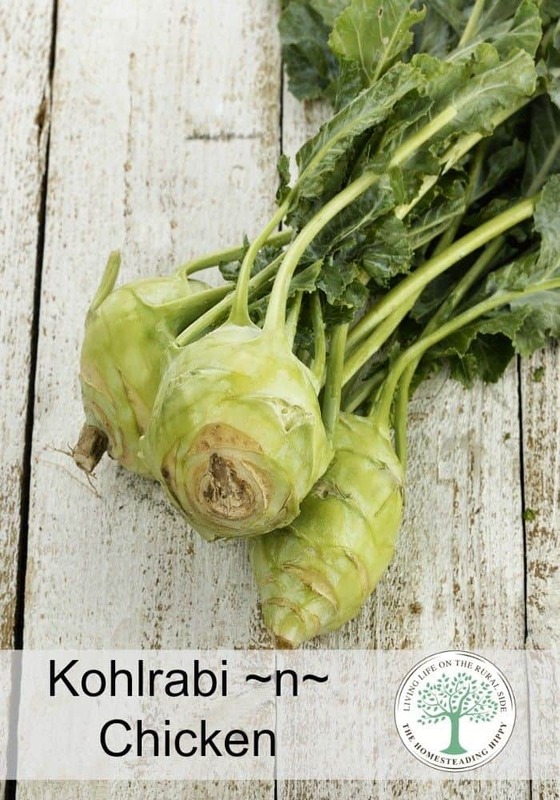 Kohlrabi leaves are edible and can be used interchangeably with collard and kale.Kohlrabi is an important part of the Kashmiri diet and one of the most commonly cooked foods. It is prepared with its leaves and served with a light gravy and eaten with rice.